If you were given an award for your life’s work — call it a Newbery, Printz, Caldecott, Oscar, Grammy, Emmy, Tony, or what have you — who would you thank? What would your acceptance speech sound like? Would it be short and sweet? Funny? Inspirational? A laundry list of names? 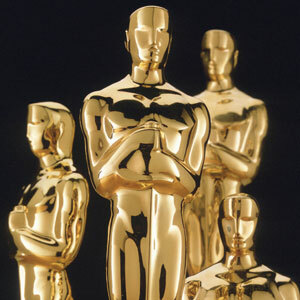 Give it a try in the comments, and I’ll pick a random commenter and award them not with an Oscar, but with a Scarlett. Scarlett Fever, that is. Extra bonus: no one will be played off! Take all the time you need. "I'd like to thank my lawyer, without whom this plea would not be nearly so lenient, and I'd like to thank my husband, who helped me bury the–oh, hang on, my lawyer's giving me the stink eye. Um, no comment." I'd like to thank my husband for sticking around even after he realised how crazy I was, and for believing me when I promised I'd buy him a sportscar with my first advance. I'd like to thank my mother's rooster, Gandalf. If he could survive being run-over, then I knew I could succeed in becoming a writer. Finally, I'd like to thank all the bad drivers who make my morning commute a nightmare. Without you, I might never of dreamed about a life where my commute involved walking down the hall. "Wow! I would like to thank my boyfriend for listening to me while no one else would. Oh my. Golly! *wipe tear* I just don't know where to start! Well, first and foremost, I would like to thank my literary agent for her endless hours of reading, reviews and revisions that got me where I am today. I couldn't have done it without her! I would like to thank my children for driving me to write in the first place, because, otherwise, I could have very well started a different, not so healthy habit. And yes, I should thank my husband, for not only listening and knowing when to say the right thing, but also for knowing when to keep his mouth shut and just agree. Thank you darling! This is such a surprise. I would like to thank Ben Franklin whose image graces those little slips of paper that I once held in my hand but not line the pockets of the judging panel. Yo, Paola, I'm really happy for you…imma let you finish. But Beyonce had one of the best videos of all time! One of the best videos of all time! I'd want to thank my parents for believing in me (even when I didn't), my husband for calling me to the table and forcing me to make the hard choices, my crit partners for making my work readable, and my local coffee shops for putting-up with my loud voice and one-drink purchase per 8-hour writing stints every other day for months on end. Oh, yeah, and my dogs for going without a bath for nearly 3 months while I worked instead of groomed, even though they were very stinky (and still actually are-LOL!). Too funny! I just wrote the acknowledgements for my book and started out with an Oscar reference! "I'll just thank all the wonderful people who made this possible. You know who you are!" I'd want to thank my husband for having faith in me, for telling me not to give up when I thought everyone felt like I was wasting my time writing books that would never get published, and for his eternal support. Probably just as important would be my critique buddies and betas, who alternately boost and deflate my ego as necessary. Thanks, y'all! This is our year! I'd like to thank my sister for answering me every time I yell out something like "I need a name! Boy. Water Mage!" Also my critique group for never pulling any punches. I can't forget all those restaurants and coffee shops who offer wi-fi, accessible outlets and patient staff. I'd like to thank my mother for having a child with an over active imagination. I'd also like to thank my husband, children, sister, critique partners for their support and help, the dog because he keeps me company when I'm writing, and last but definitely not least, Thesaurus.com for helping me with the right words. Oh wow, oh wow, I can't believe this. I don't think I'm really awake right now. Wow. I *insert laugh here* prepared a speech, but who really ever thinks they'll get to give it? *pulls out a 100 foot scroll* Wow. I'd like to thank my family. My mom for always telling me to just write. My dad for never reading my stuff for fear of running into something he'd not be able to look me in the eye for, but still supporting me anyway. My brothers for being so darn successful that I had to come up with a career that would out shine them. My grandmother for telling me that no matter how dirty I write, she's probably read worse. Thanks grandma! I'd like to thank my critique partners, the Lit Girls: Tracy, Beatriz, Wendy, Misa, Marty, Jessica, the originals, for being such wonderful support. To NTRWA for giving me my first contest wins. DFWWW for offering me a safe haven of writers every Wednesday night whether I'm there or not. My creative writing teacher, Ms. Jocks, for teaching me how to finish a book. My lit professor, Mr. Wheatcroft-Pardue for telling me I should be a writer, not a scientist. My eighth grade english teacher, Mr. Morris, who let me write the longest book reports he'd ever read and encouraging me when wrote my first book during his class, even while he tought. My dogs, who are my family. My friends, who are my family. My amazing Agent, person yet to be named, my amazing editor, also yet to be named. My ex-husband for bringing up my writing as a bad thing during court. Ha. I say. And to every person who has ever supported me in any way. Thank you So much for this. I love you all! "Whoa. This is just awesome. Um… uh, thanks for everyone who helped me get this award, and special thanks to my mom, who was able to not say anything when I told her I didn't need makeup or high heels for this." "um…um…um… oh my gosh … I … um … oh my gosh" (as I hold onto my chest). That would go on until I got the the warning music and pulled off the stage by the hot guy in a tux. This is such an honor for a nobody with a dream. When I was young I thought there was something wrong with me, immersed in day dreams, that many of my middle and high school teachers can attest to! It seemed there was so much in those dreams that I started to put them down on paper and here we are, to find that someone else actually found it interesting, Literary Agent…Publisher and the literary public, is still surreal. I thought my husband would laugh when I told him I was serious about being a writer, he surprised me with his sincere support and true belief in me. To my children who understood that if I didn't answer them when they called, Mummy was lost in her imaginary world and when they called the third and fourth time it was selective hearing. They never questioned, never tried to sneak a peek and were supportive of my hours at the computer. To my parents for putting up with my head in the clouds from age 0-now and one thing to Mr Fisher,my high school Biology teacher, see I didn't end up a cashier at the bookies! Ha! And to all those who played an integral part in this labour of love, thank you!